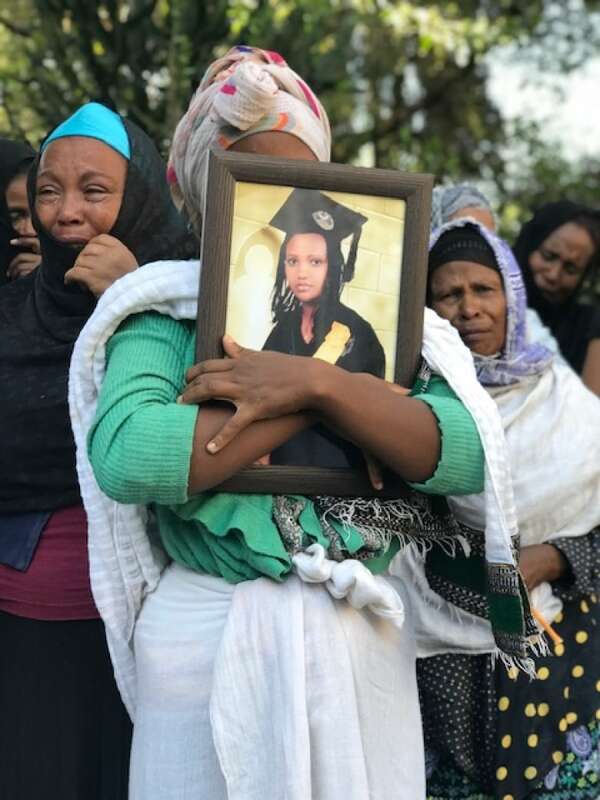 Preliminary data retrieved from the flight data recorder of the Ethiopian Airlines plane that crashed shows “a clear similarity” with an earlier disaster in Indonesia, Ethiopia’s transport minister said Sunday. “The black box has been found in a good condition that enabled us to extract almost all the data inside,” she told reporters Sunday evening. Officials say 157 people from 35 different countries were killed when the Nairobi-bound plane crashed shortly after takeoff. Canada, the U.K., U.S. and many other countries then grounded the Boeing 737 Max 8 as it also was the aircraft in the Lion Air crash in October in Indonesia. Earlier Sunday, thousands in the capital of Addis Ababa mourned the country’s victims in the crash, accompanying 17 empty caskets draped in the national flag through the streets of the capital. Some victims’ relatives fainted and fell to the ground. Family members confirmed they were given a kilogram sack of scorched earth taken from the crash site. Many relatives already have gathered at the rural, dusty crash site outside Ethiopia’s capital.